Many times when a fire occurs in a home, not only does the smoke and soot damage the home, but water damage also results from the efforts of the firefighters. The SERVPRO of Boone County technicians are experts in both fire and water damage restoration. 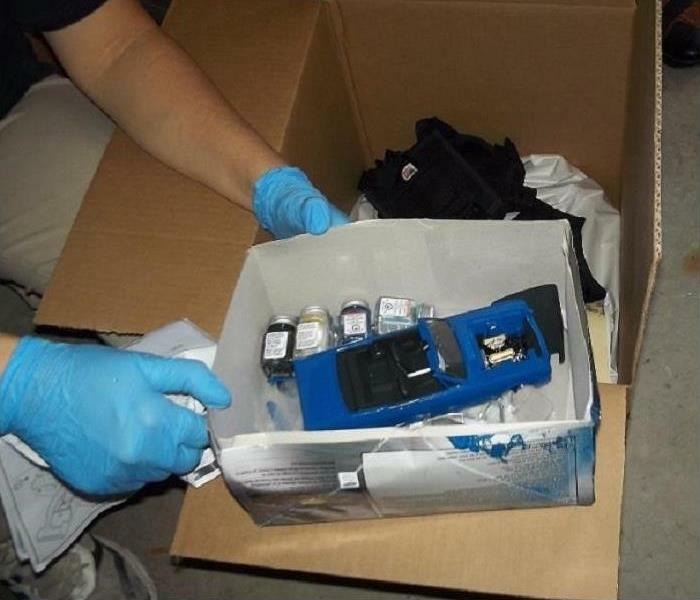 They use advanced techniques to efficiently restore the property to preloss condition. Did you know that SERVPRO is a sponsor of the PGA Tour? We are very proud to be designated as the official cleanup and restoration company of both the PGA Tour and the Champions Tour! 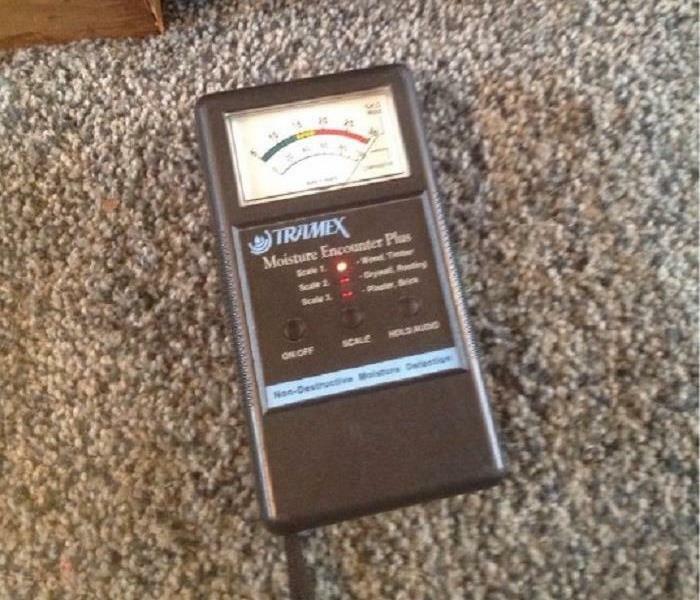 The SERVPRO of Boone County water technician is taking a moisture reading after heavy rains left water damage in an Erlanger, Kentucky home. SERVPRO of Boone County is available to provide emergency service 24 hours a day and 7 days a week! There has been rapid advancement in the technology and techniques used in the restoration industry. The SERVPRO of Boone County technicians use industrial strength equipment to restore a property back to preloss condition quickly, reliably, and more effectively. When a fire emergency occurs at a property, the SERVPRO of Boone County fire technicians understand that a quick response is crucial to lessen damage and restoration costs. After a fire in Florence, Kentucky, we were onsite quickly to assess the damage and begin the cleanup process. 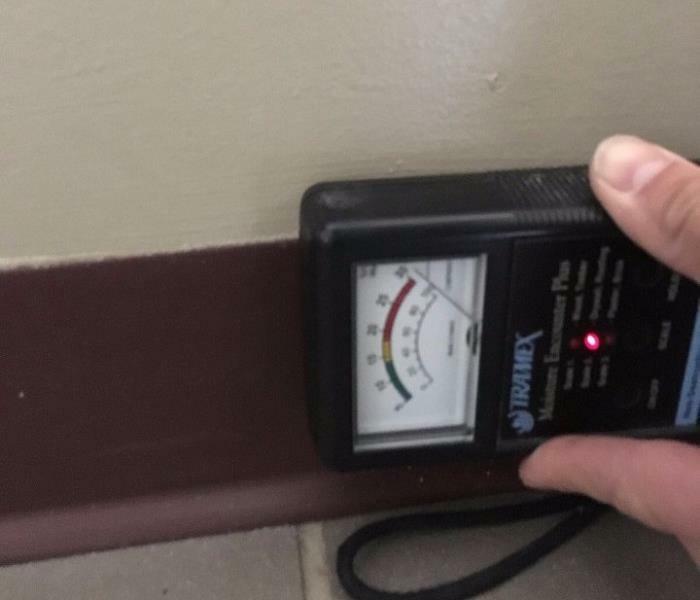 SERVPRO of Boone County was called for water restoration services at an apartment complex in Covington, Kentucky when a clogged water line in the unit above caused damage to the unit below. Our water technicians reponded quickly to the site to begin services and help make it "Like it never even happened." It only takes a small leak or even excess humidity for mold growth to occur...And then it can spread very quickly! 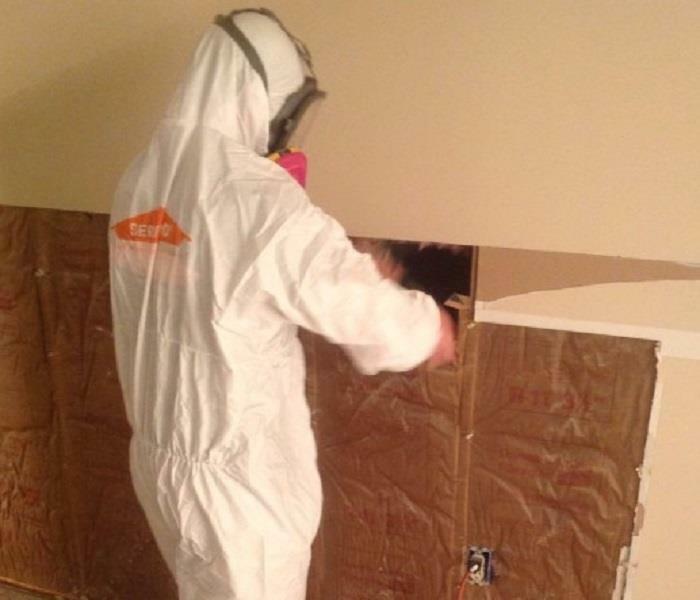 The SERVPRO of Boone County technicians are experts in water damage restoration and mold remediation. 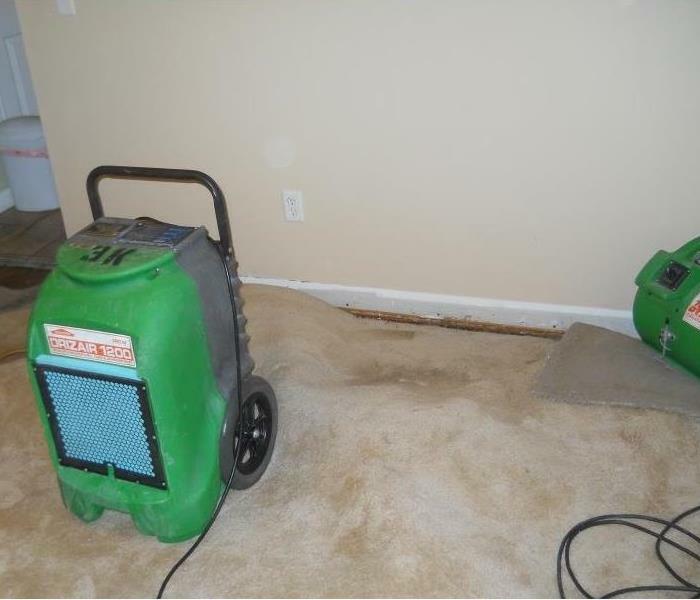 When water damage or mold issue arises in a Northern Kentucky property, they respond quickly to get the property back to preloss condition! When a sump pump fails during heavy rains, water damage is often the result. SERVPRO of Boone County was called to a home in Burlington, Kentucky for water damage restoration. The technicians removed the wet portions of the drywall to access the water damage behind the walls. Performing water restoration effectively requires specialized equipment and technicians with advanced knowledge and expertise. The SERVPRO of Boone County technicians are highly trained and use industrial strength drying equipment during the restoration process. SERVPRO of Boone County provided water restoration services at this commercial property in Walton, Kentucky. 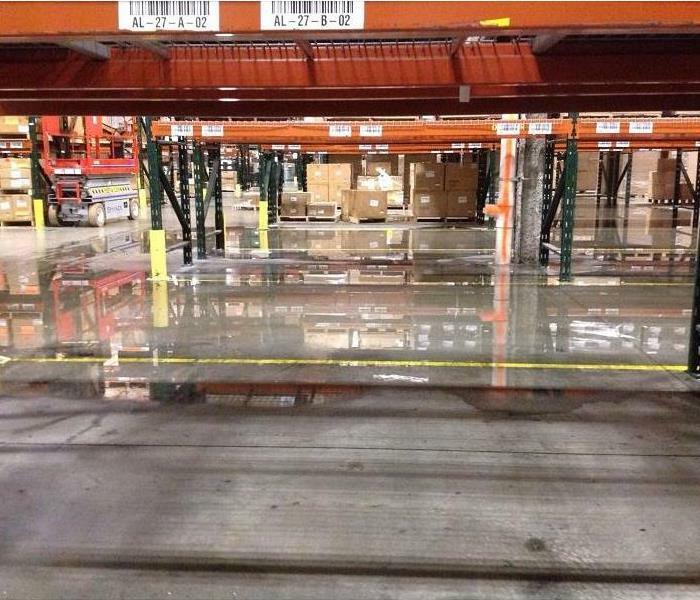 A sprinkler system in the building malfunctioned leaving water damage throughout the large warehouse. With industrial strength equipment and extensive knowledge in the industry, our technicians can handle a disaster of any size! 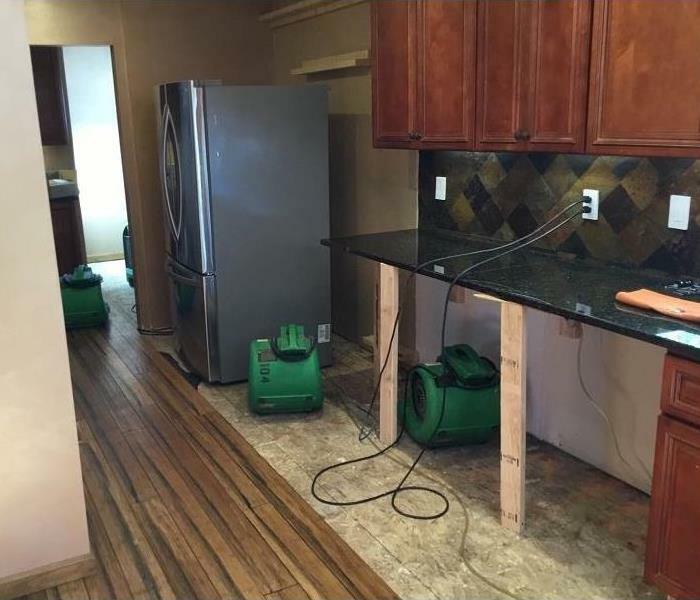 After a dishwasher leak caused water damage at this home in Florence, Kentucky, SERVPRO of Boone County was ready to help! 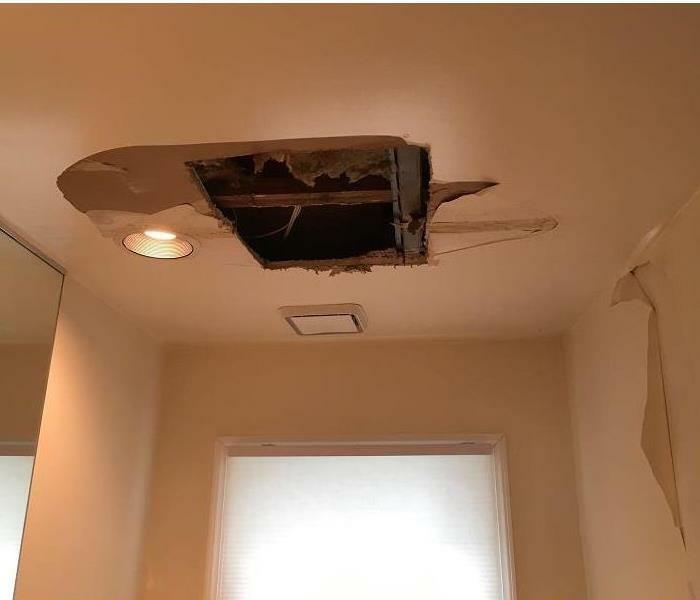 We are locally owned and operated, so when a water damage emergency arises like this one, we are nearby and can arrive quickly to begin restoration. 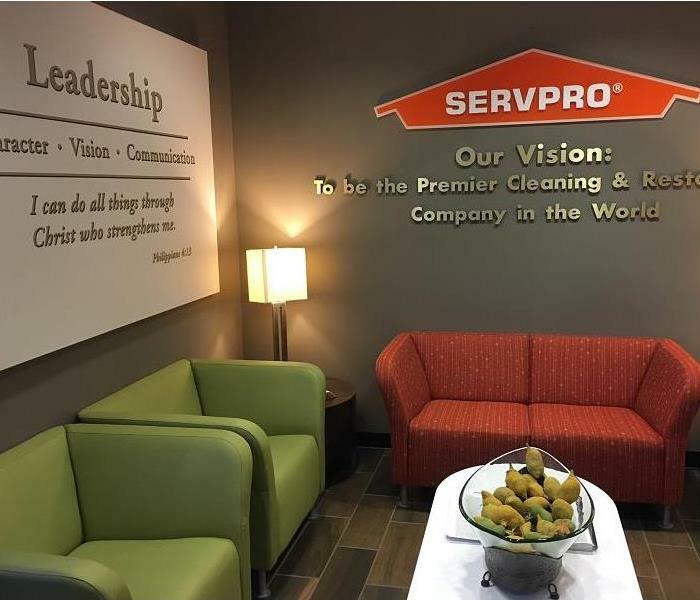 Our SERVPRO of Boone County team welcomes any opportunity to learn and improve on what we do! 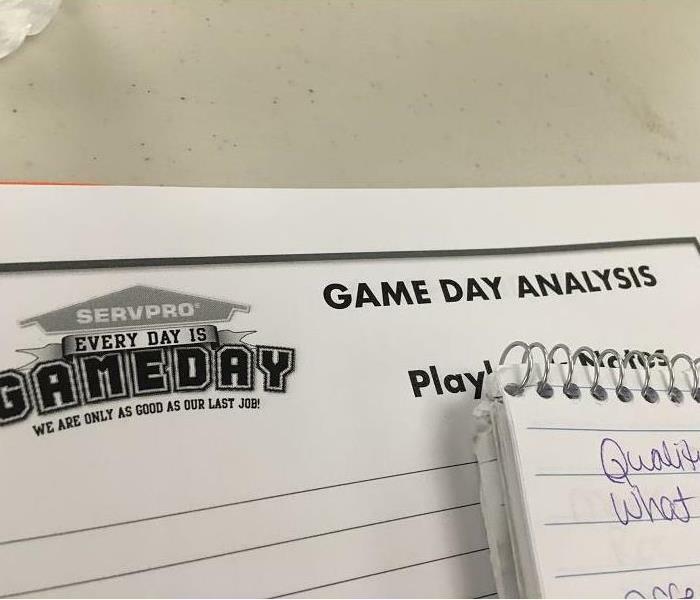 Our time at the SERVPRO Kentucky Conferences is always time well spent training and planning. We realize that we are only as good as our last job and are always striving to get better! A hot water heater leaked at this home in Cold Spring, Kentucky and SERVPRO of Boone County was called for water restoration services. Upon inspection, the technicians found a mold issue as well. 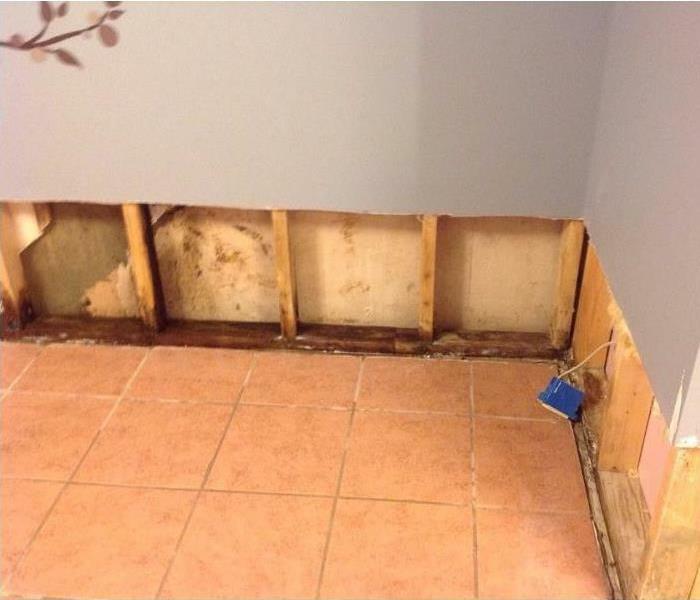 So in this case, both water restoration and mold remediation was needed. Diana is focused and working hard to clean the contents of a home after fire damage. Our cleaning technicians are well trained and specialize in restoring contents damaged by water, fire, or mold. 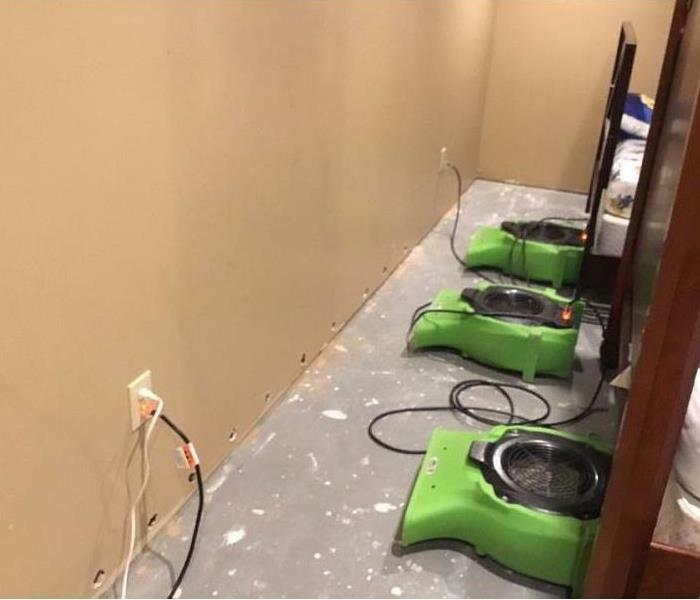 SERVPRO of Boone County was called for water restoration services at a home in Union, Kentucky after heavy rains caused flooding. As part of the restoration process, the water technicians removed the baseboards and behind the baseboards, a pre-existing mold issue was discovered. Luckily our technicans are experts in mold remediation as well! When performing mold remediation services, it is important to put up containment barriers. 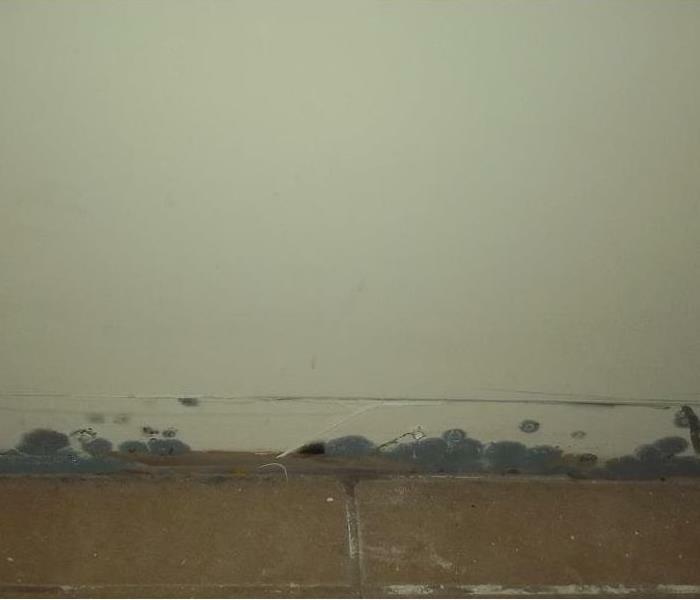 These barriers help to prevent the mold from spreading to other areas of the property. 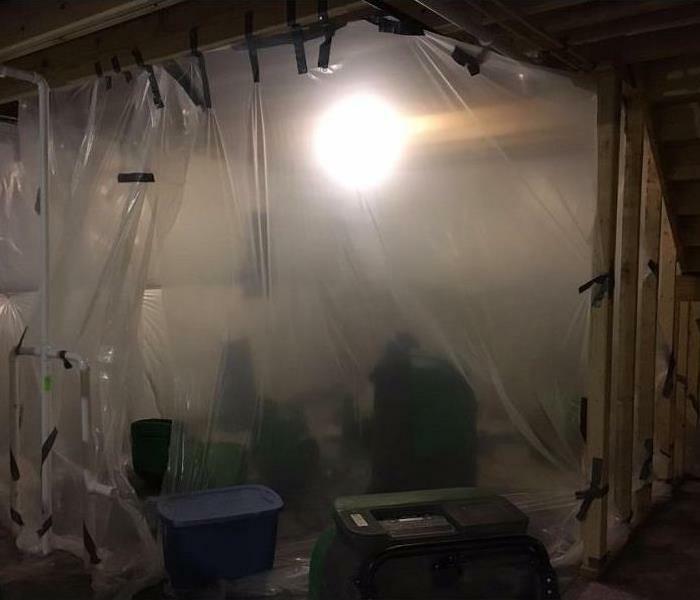 This photo shows the containment barriers installed by the SERVPRO of Boone County technicians before starting the mold remediation process. 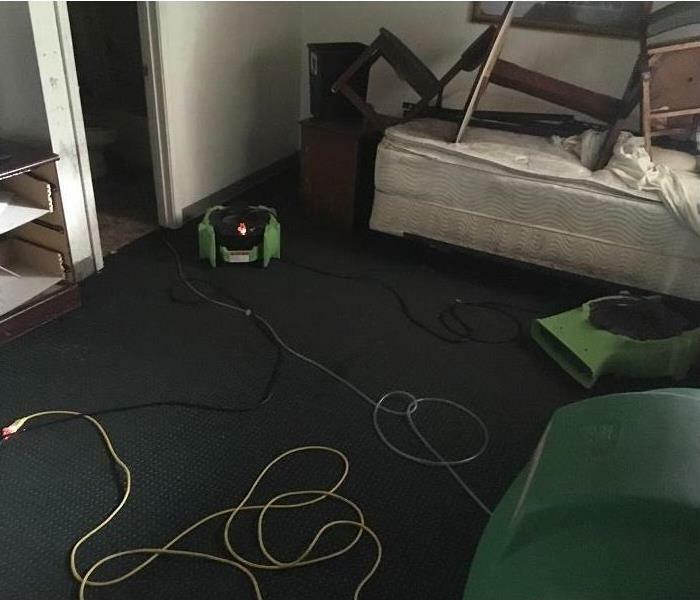 After water damage in a home located in Florence, Kentucky, SERVPRO of Boone County was called to help! The water technicians assessed the damage and developed a plan of action. Here is a zone sketch of the damaged area showing how equipment will be placed. 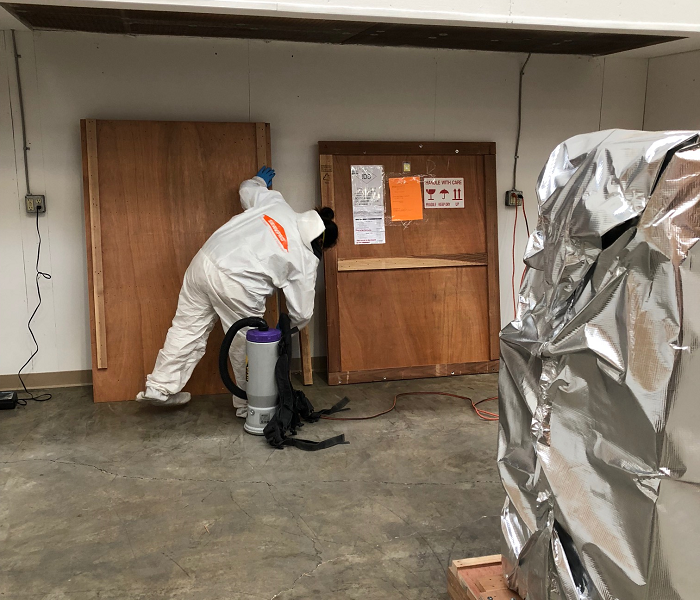 The contents of a property that were affected by mold damage were brought to our warehouse for mold remediation. A SERVPRO of Boone County production employee is wearing protective gear during the process. This gear includes a tyvec suit and a full face respirator. 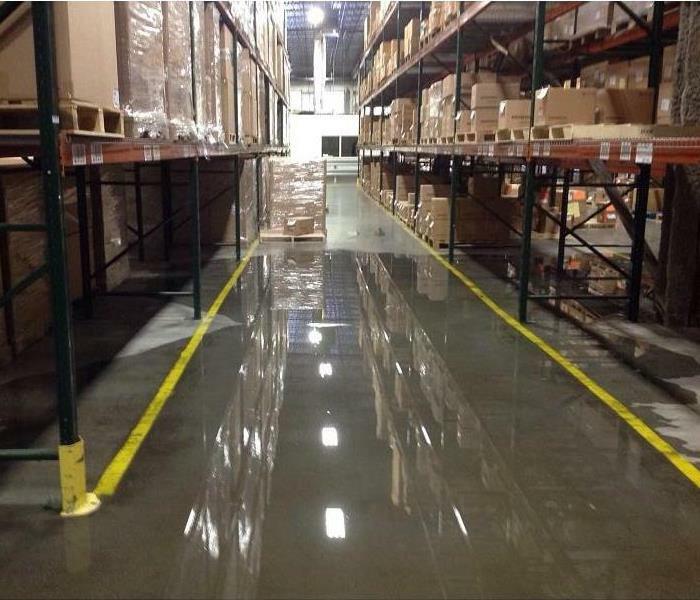 A broken sprinkler system caused extensive water damage to a 10,000 square foot warehouse located in Walton, Kentucky and SERVPRO of Boone County was called to help! Our water crews responded quickly to extract the standing water in the affected areas. 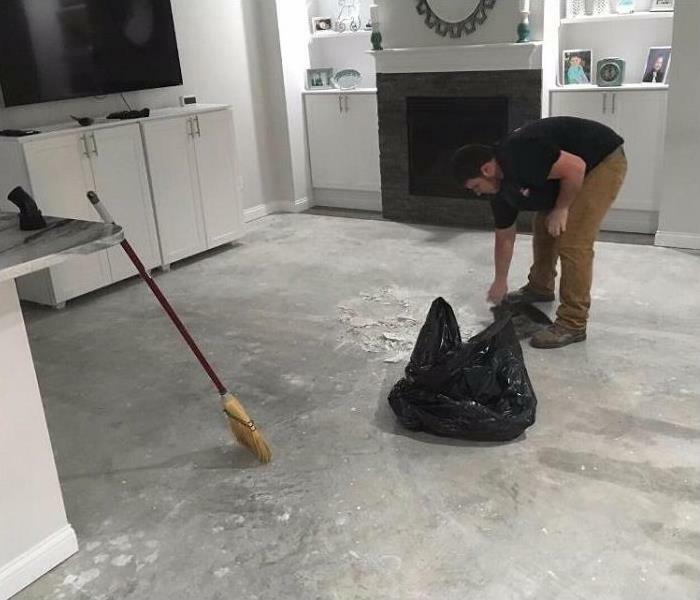 The SERVPRO of Boone County water technician is busy cleaning up and bagging debris after a water damage restoration project in Union, Kentucky. 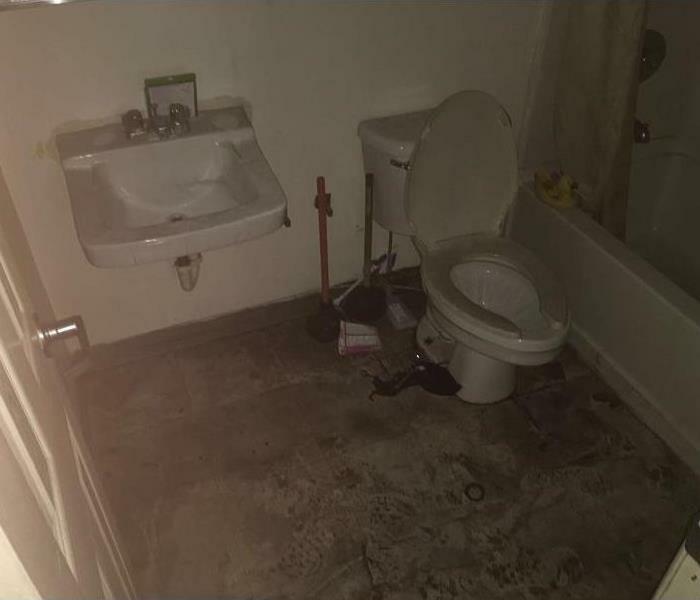 This water damage was caused by a toilet overflowing on the main level of the home. 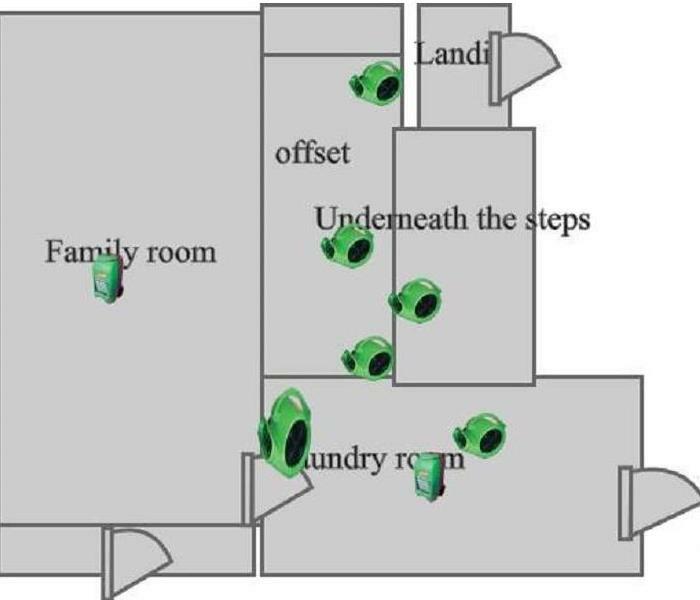 When a fire occurs, the damage isn't limited to just the immediate area of the fire. Soot and smoke travel throughout the property leaving damage behind. 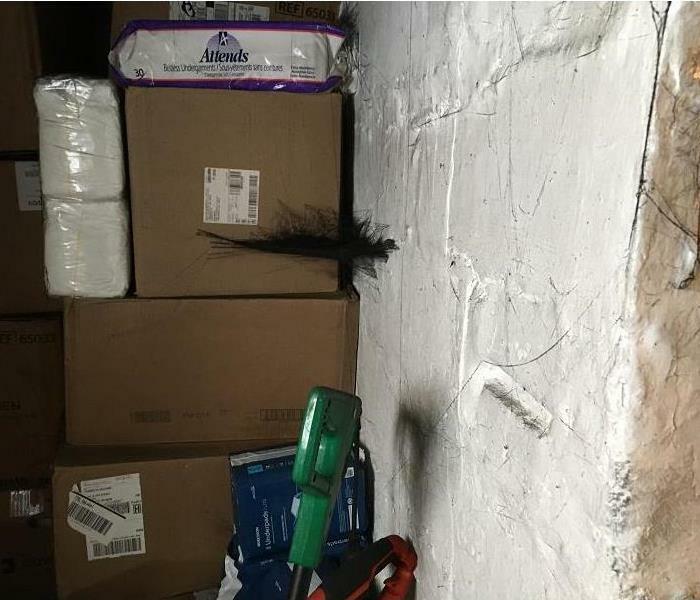 This photo shows soot trapped in a cobweb in the corner of a room after a home fire. 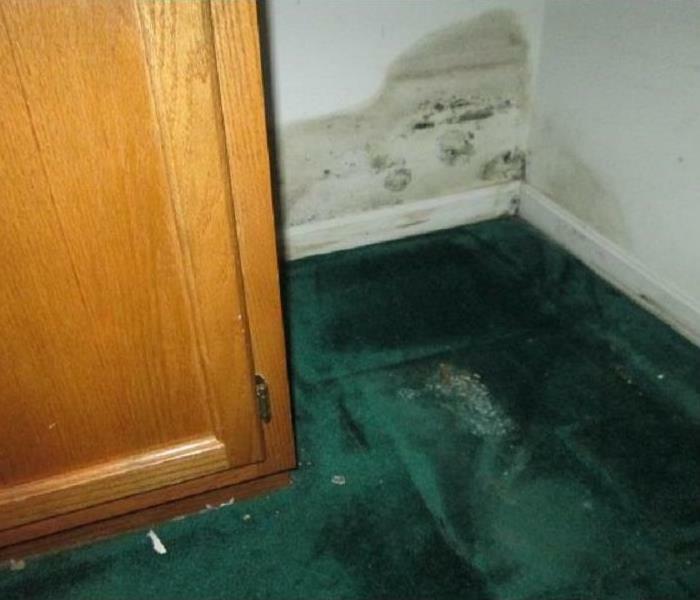 Mold damage can often occur after a water leak, especially if the leak goes undetected for awhile. 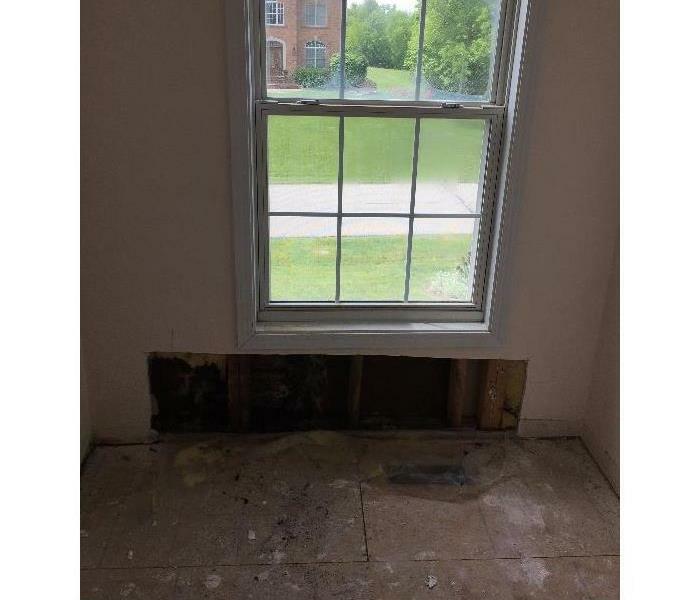 The owner of this home in Union, Kentucky was remodeling and discovered mold hiding behind the drywall under the window. This issue was most likely caused by an undetected window or roof leak. 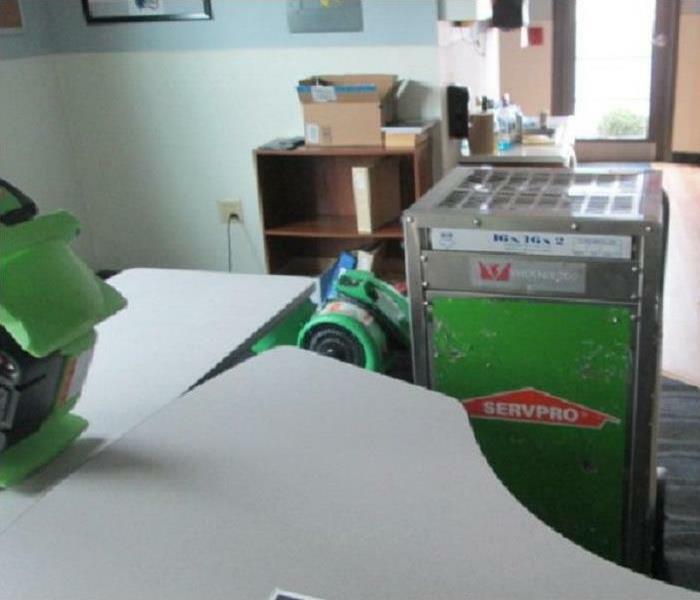 Water damage occurred at this commercial property and SERVPRO of Boone County was Here to Help! This photo shows the drying equipment brought on-site and ready to be placed in the affected areas of the building. 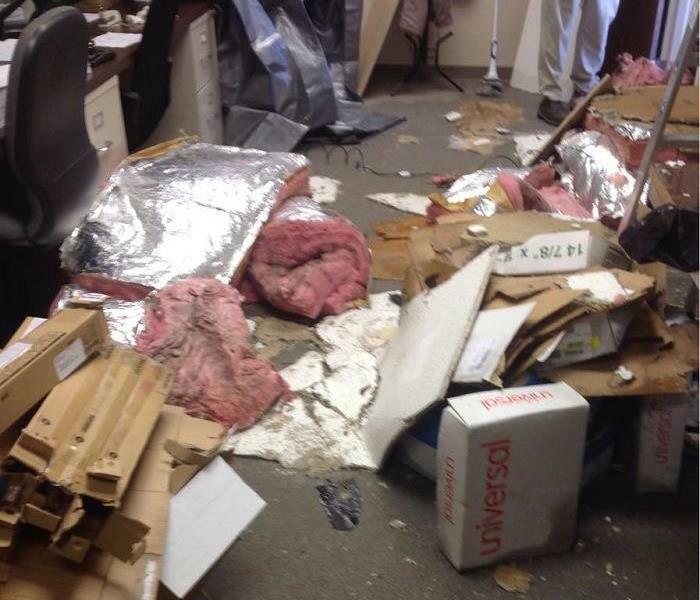 A sprinkler system malfunctioned at this business property in Burlington, Kentucky and this is the mess that was left behind! SERVPRO of Boone County responded quickly for mitigation services to get this company’s property back to normal! 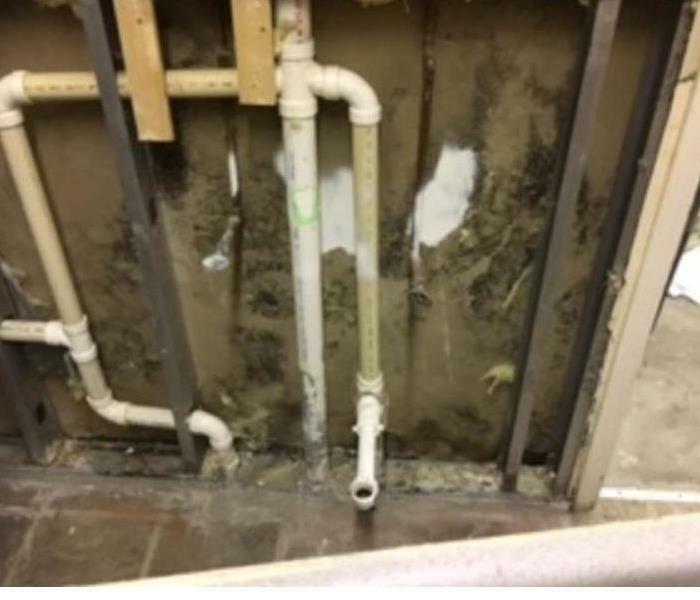 Water restoration was needed at a commercial property in Florence, Kentucky and SERVPRO of Boone County was called for help. 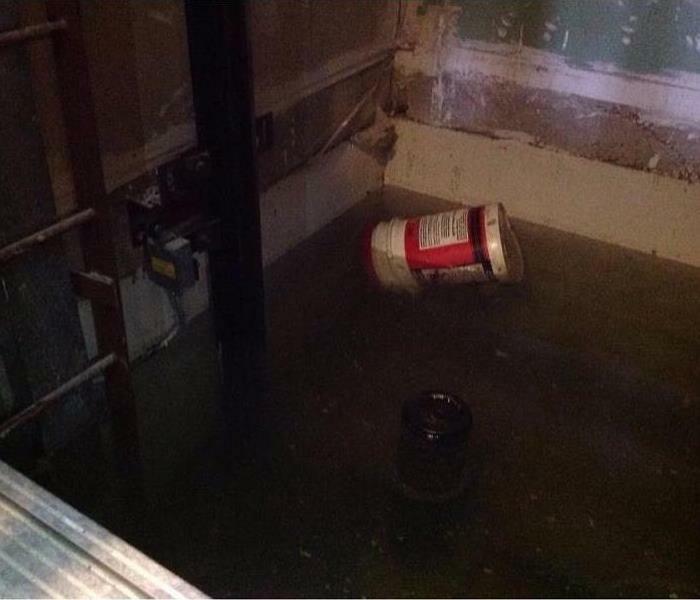 This photo shows the standing water in the elevator shaft of the building that needed extraction. 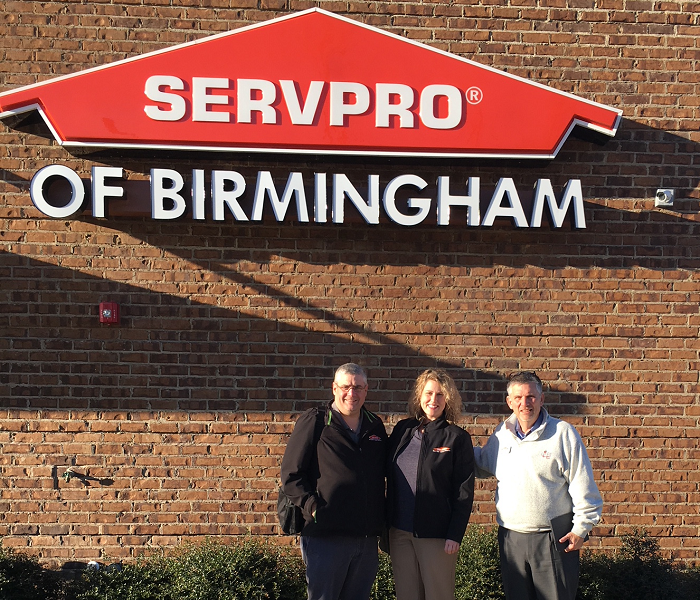 Recently our marketing team had the opportunity to attend training sessions at the SERVPRO franchise in Birmingham, Alabama. It was a great experience for our marketers! They learned new and interesting ways to meet the needs of our customers! The SERVPRO of Boone County technicians are fire and water restoration specialists. We have the training, experience and specialized equipment necessary to restore a home or business after a fire damage event. We are committed to providing superior service while restoring the property back to pre-fire condition. 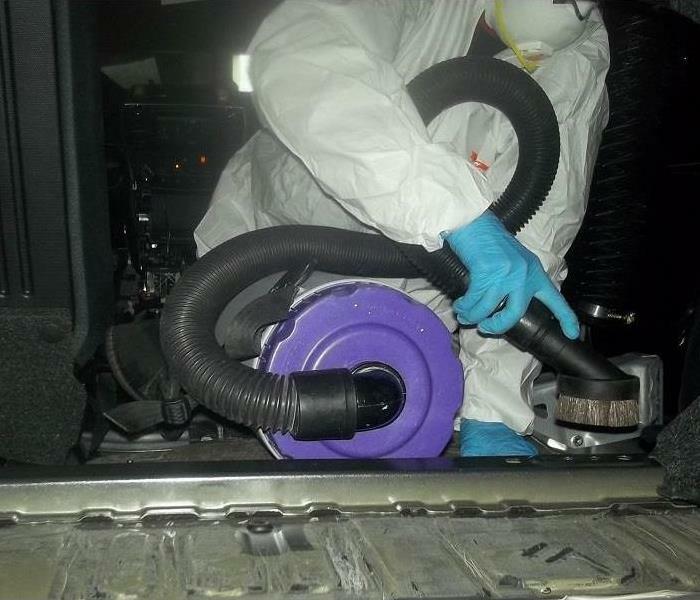 SERVPRO of Boone County was called to provide mold remediation services when mold was found growing in this car. For this project, it was necessary for our technicians to remove different parts of the car so that each piece could be thoroughly cleaned. Once the process was complete, the car was put back together and ready to go! When heavy storms hit Northern Kentucky a local school was faced with flooding and water damage. SERVPRO of Boone County was ready to help! 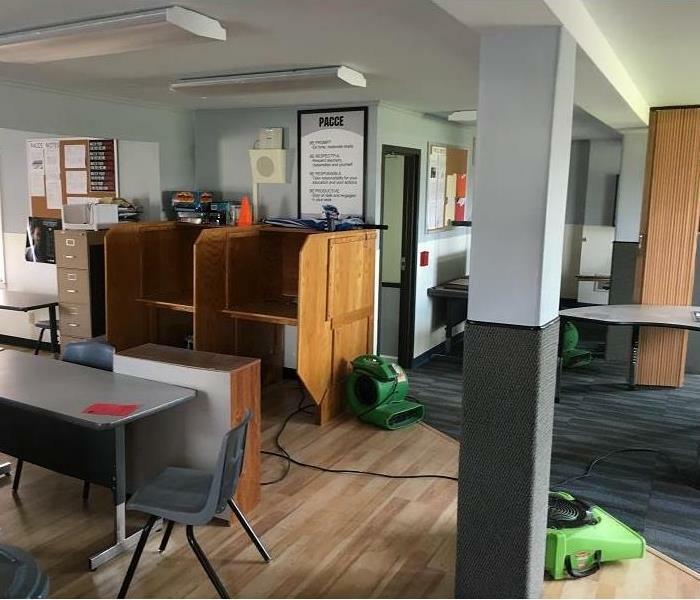 The photo shows one of the classrooms with the equipment set up during the dryout process. 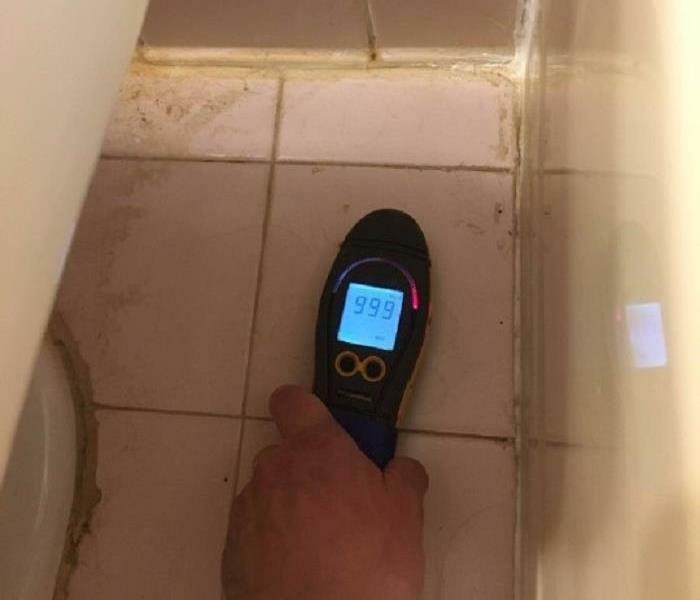 A SERVPRO of Boone County water technician is taking a moisture reading after water damage in an Alexandria, Kentucky property. Our water technicians are experts in the industry and use advanced equipment to help detect hidden moisture. This equipment is important to ensure that the dry out process is complete. 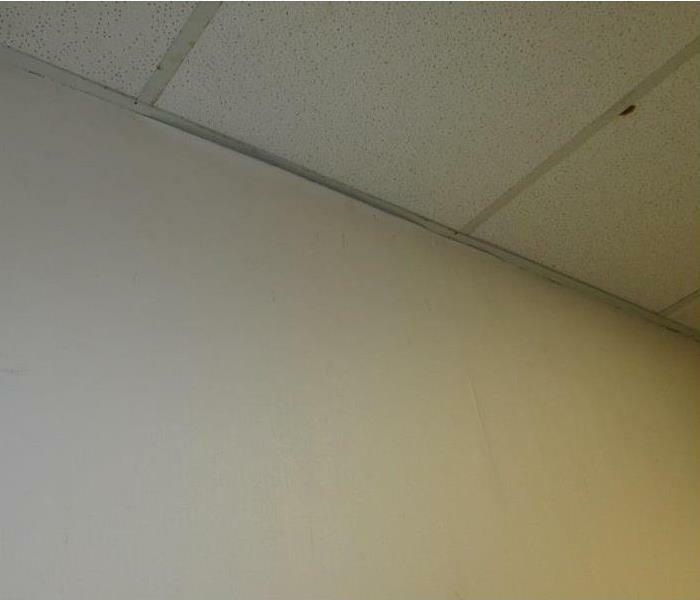 A burst pipe in the ceiling of this commercial building in Alexandria, Kentucky caused water damage throughout the building. 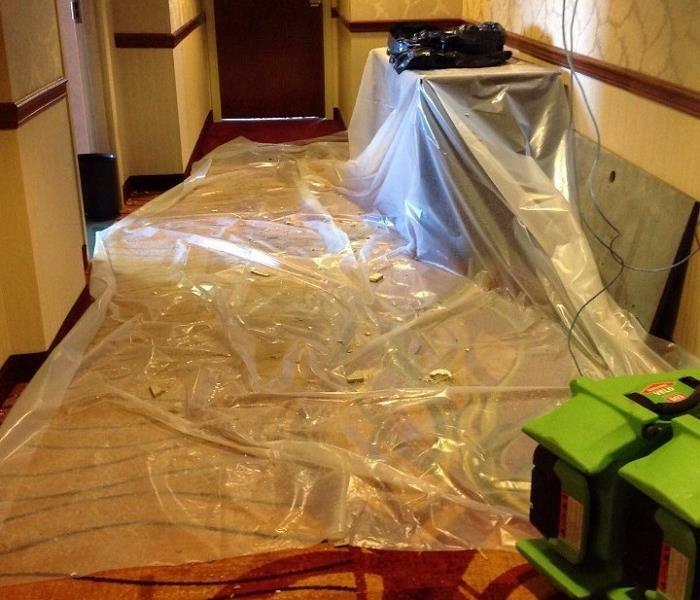 SERVPRO of Boone County is a trusted leader in the restoration industry and understands there is never a convenient time for water damage to strike a business. We are available 24 hours a day and 7 days a week for emergency service! 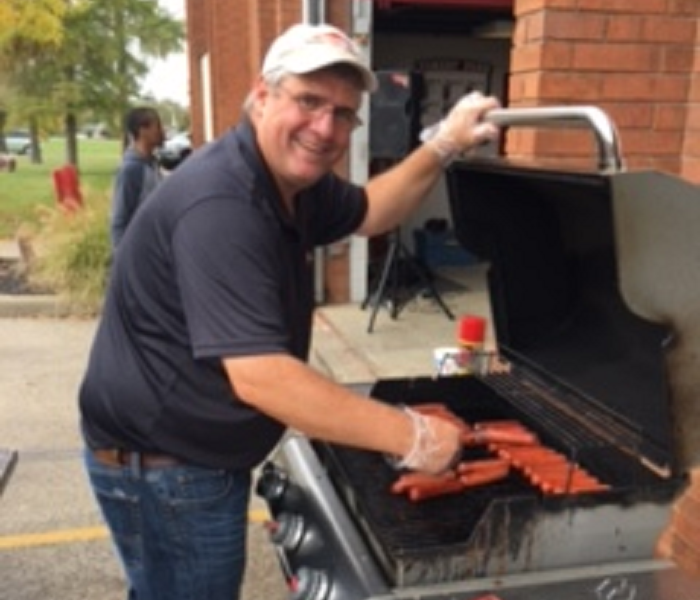 The SERVPRO of Boone County staff had a great time participating in a Community Day to help bring fire safety awareness to residents in the area. It was a day full of fun with fire trucks, helicopters, fire demonstrations, crafts, food and more! 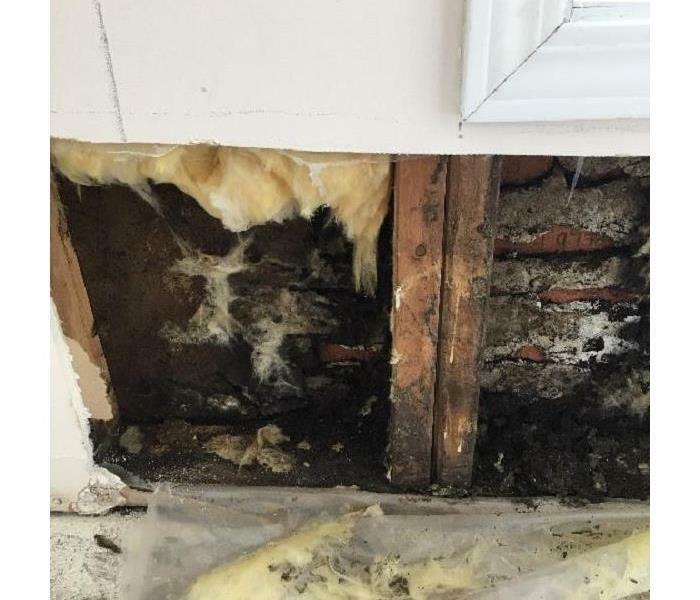 The owner of this home in Union, Kentucky was remodeling and discovered mold hiding behind the drywall under the window. 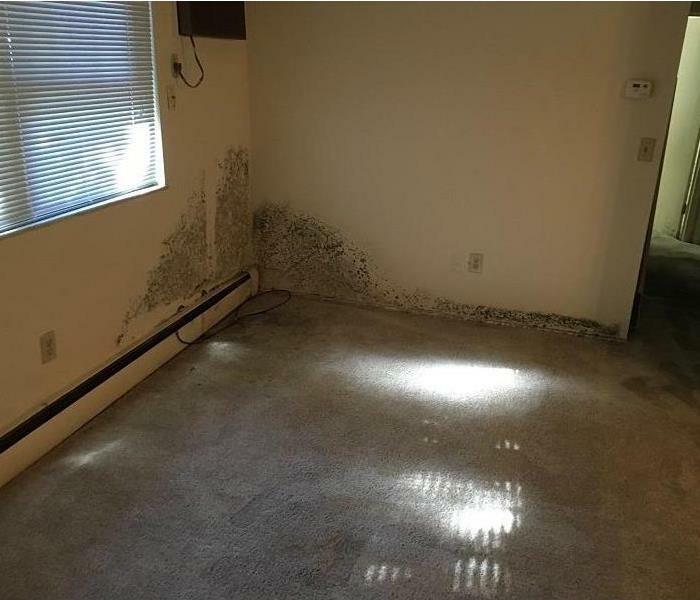 A mold problem can often occur after a water leak. This issue was most likely caused by an undetected window or roof leak. Heavy storms and a failing sump pump are never a good thing! SERVPRO of Boone County was called to help with the water damage in the basement of this home in Union, Kentucky. We responded quickly, extracted the water and made sure that the area was restored back to normal! When a fire occurs in a home, not only the structure of the home is affected, but the contents of the home are damaged as well. 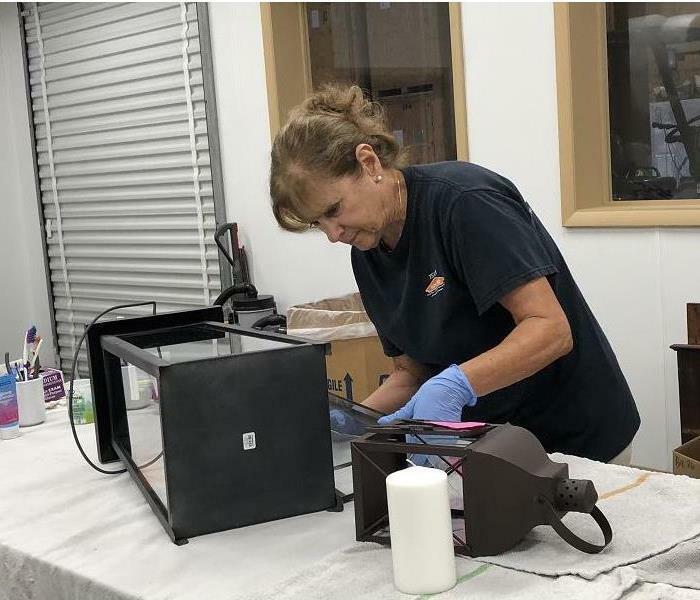 The fire technicians at SERVPRO of Boone County are trained in the special techniques it takes to restore items after a fire. This is one item that was brought to our warehouse for restoration after a home fire. 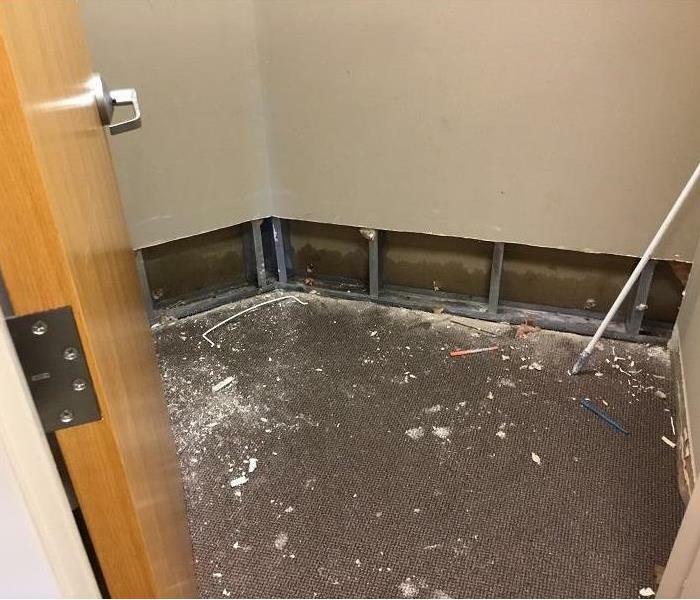 SERVPRO of Boone County was contacted after a pipe burst and caused water damage to this commercial property in Erlanger, Kentucky. We responded quickly so that this business could get back to business as quickly as possible! A faucet left running can make a big water damaged mess! 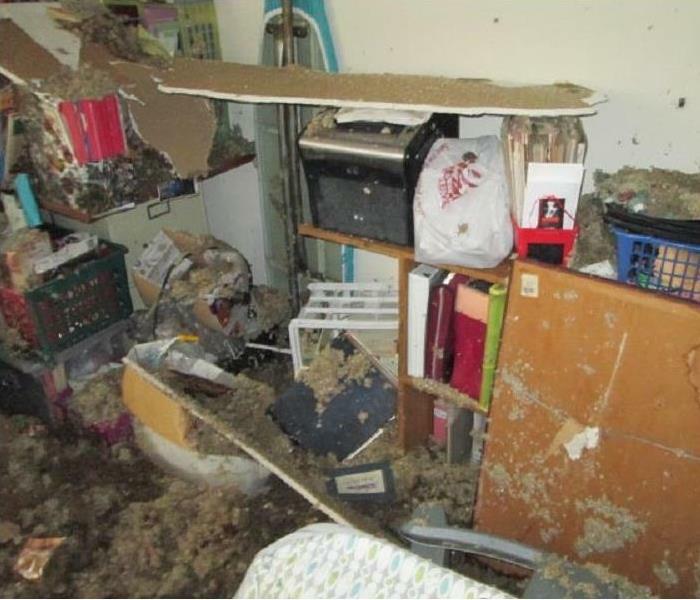 This is another photo of the water damage to a home in Florence, Kentucky. Rooms on both the second and first floors of the home were affected. SERVPRO of Boone County was here to help! Heavy rains and a failing sump pump can lead to water damage! 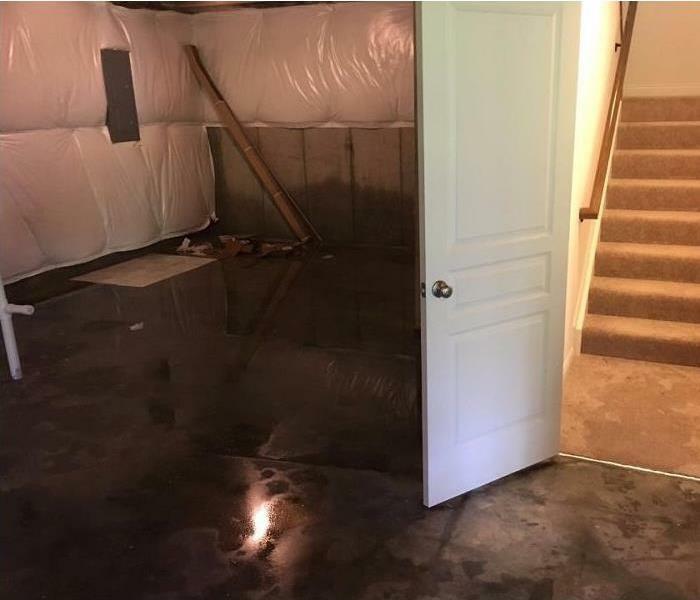 The finished basement of this home in Florence, Kentucky was flooded after storms in the area. The SERVPRO of Boone County water technicians responded quickly to get the equipment in place and the basement restored! Mold thrives in moist areas. It can most commonly be found in places like showers and tubs, leaky sinks or pipes and basement walls or crawlspaces. Mold is evident on the shower enclosure of this home in Florence, Kentucky. SERVPRO of Boone County was here to help! A fire can be devastating to a homeowner. This home in Walton, Kentucky was damaged extensively when a fire started in the garage. SERVPRO of Boone County fire crews packed and moved the contents of this home to the warehouse for cleaning and restoration. We Are Only as Good as Our Last Job! We always welcome the opportunity to learn and improve on what we do! We recently attended the SERVPRO Kentucky Conference and it was a fantastic day of training and planning! We are only as good as our last job! Fire damage can be devastating for homeowners. As can be seen in this photo of a home in Walton, Kentucky, once the fire department leaves, there is often additional damage left behind due to the firefighting efforts. 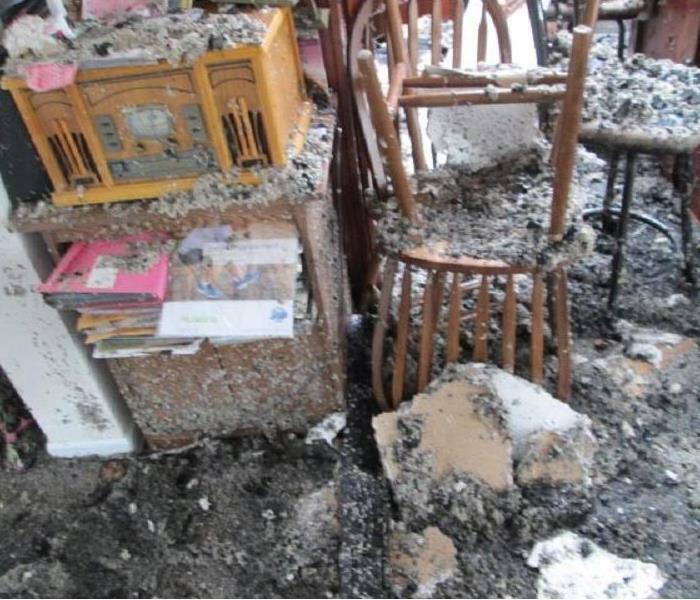 We have the specialized fire and water damage restoration training and personnel to handle damage like this and can quickly restore the home to pre-fire condition. Heavy storms damaged the roof of this commercial building in Walton, Kentucky. As a result, the interior of the building was affected by water and required water restoration services. SERVPRO of Boone County responded quickly to get the building back to preloss condition! 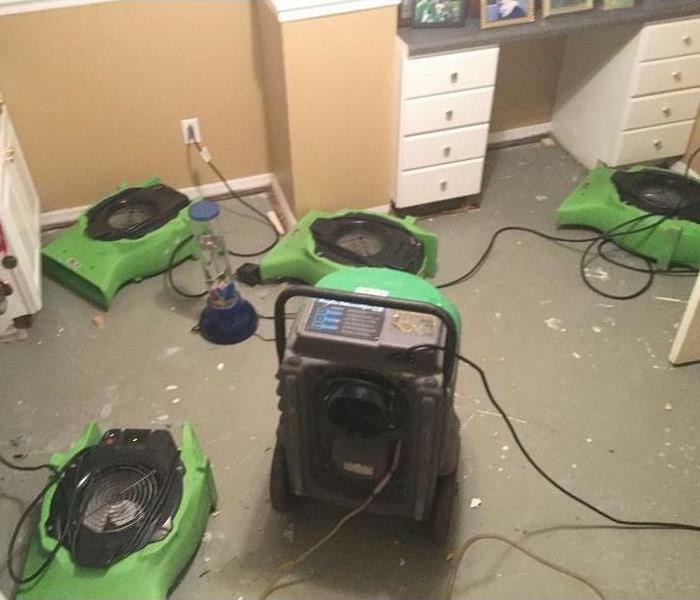 The SERVPRO of Boone County water technicians have air movers set up and working hard to dry out this basement in Union, Kentucky. 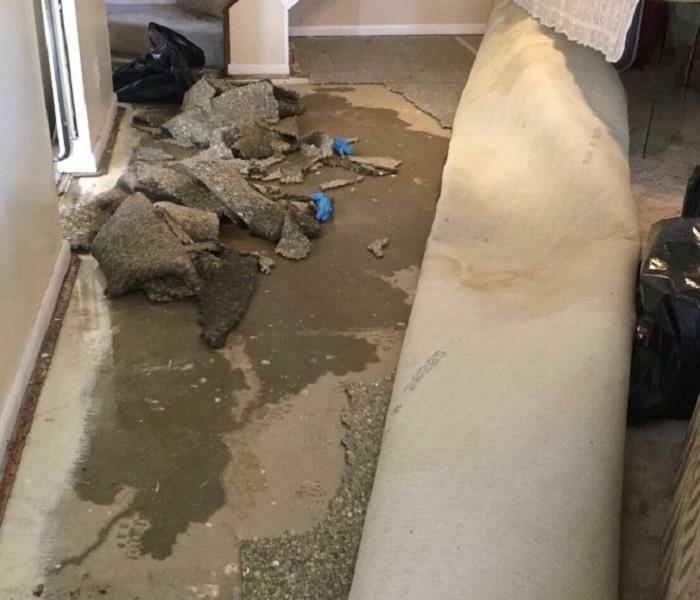 Extremely heavy rains caused water to invade the basement and the carpet was saturated. This looks like a job for SERVPRO of Boone County! 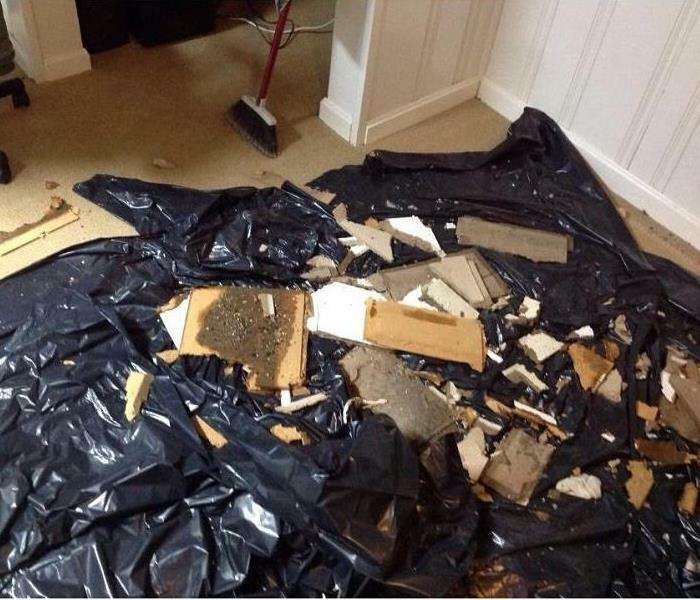 This is damage to a finished basement in Fort Thomas, Kentucky when a bathtub faucet broke in the bathroom above. The drop down ceiling and the carpet and padding in the basement were affected. 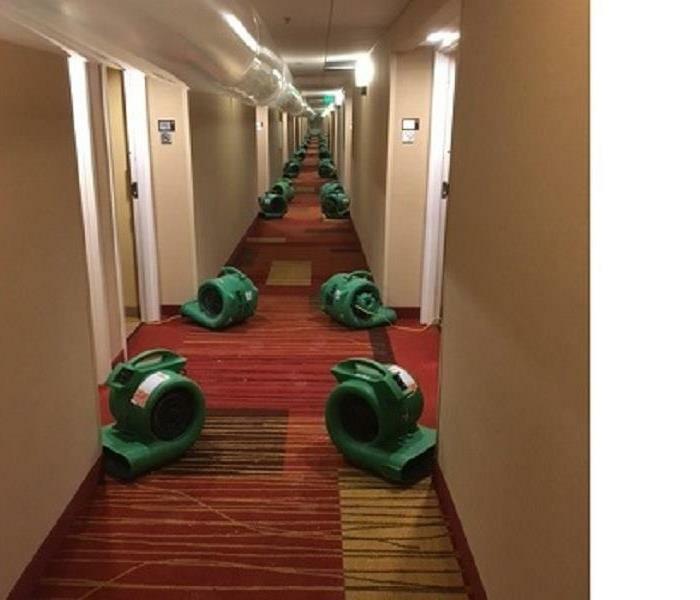 SERVPRO was available for after hours emergency service to clean up and dry out the affected areas! A fire in the condominium above this unit caused smoke, fire and water damage throughout this unit as well. SERVPRO of Boone County was called to pack and remove the contents for this property owner so that repairs could then be completed. Mold thrives in moist areas. It can most commonly be found in places like showers and tubs, leaky sinks or pipes and basement walls or crawlspaces. But sometimes it hides in places you might never suspect! In this instance, mold was found hiding under the tiles of the ceiling in this property. The SERVPRO of Boone County water technicians are experts in water restoration. 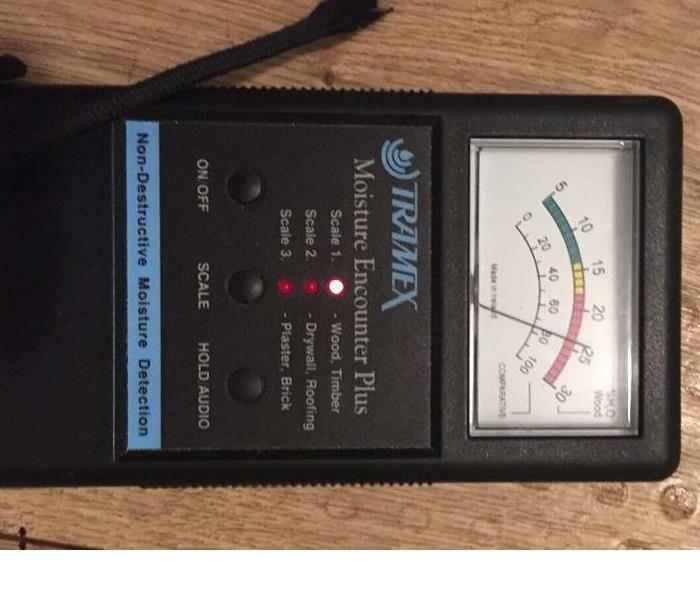 Our advanced equipment helps to detect hidden moisture to ensure that the dry out process is complete. This photo shows the technician taking a moisture reading after a home suffered a water loss. The roof and siding of this Union, Kentucky home were damaged by a tornado and emergency service was needed. 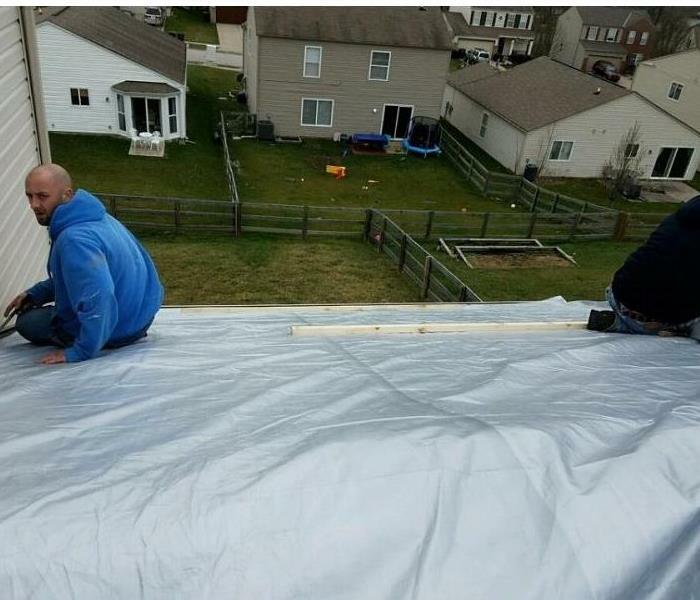 In this photo, SERVPRO of Boone County crews are in action installing tarps over the damaged areas to prevent water damage to the interior of the home. This home in Burlington, Kentucky suffered fire damage when an outlet caught fire in one of the bedrooms. 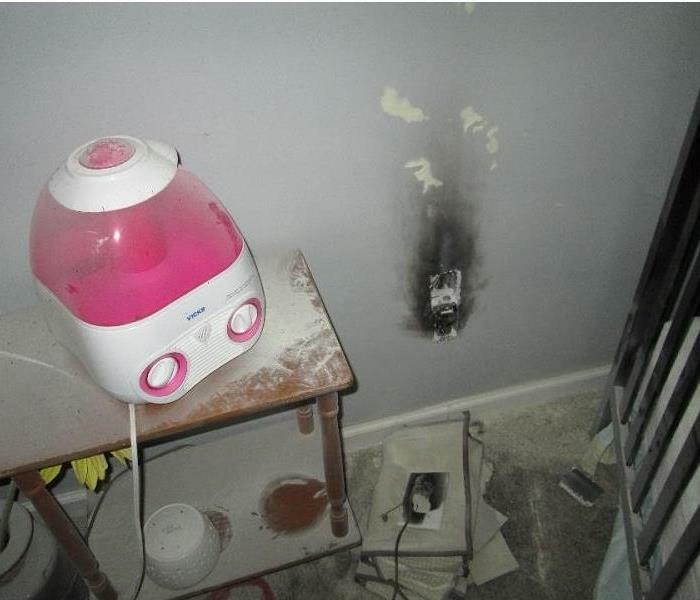 As a result there was smoke and fire extinguisher dust on the items throughout the home. 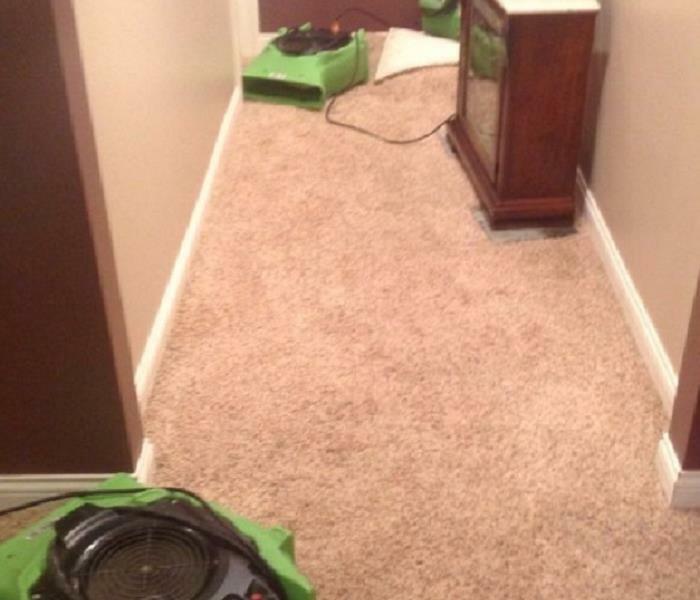 In this instance, SERVPRO of Boone County provided services to clean all the contents of the home. 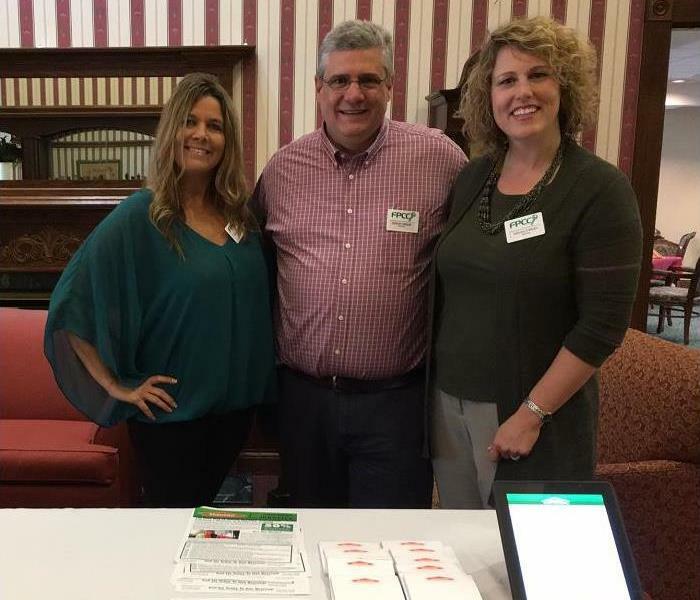 Our SERVPRO marketers, Megan O’Brien, Jen Morris, and Jeremy Adams are working hard to spread the word about the SERVPRO Emergency Ready Profile app! Minimize your business interruption by developing a SERVPRO Emergency READY Profile and having an immediate plan of action in place...Be ready if disaster strikes! 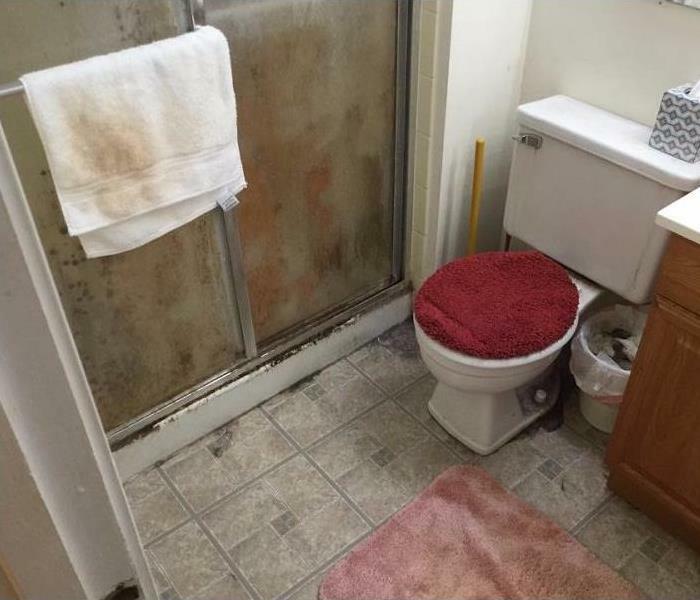 Mold can hide where you least expect it! 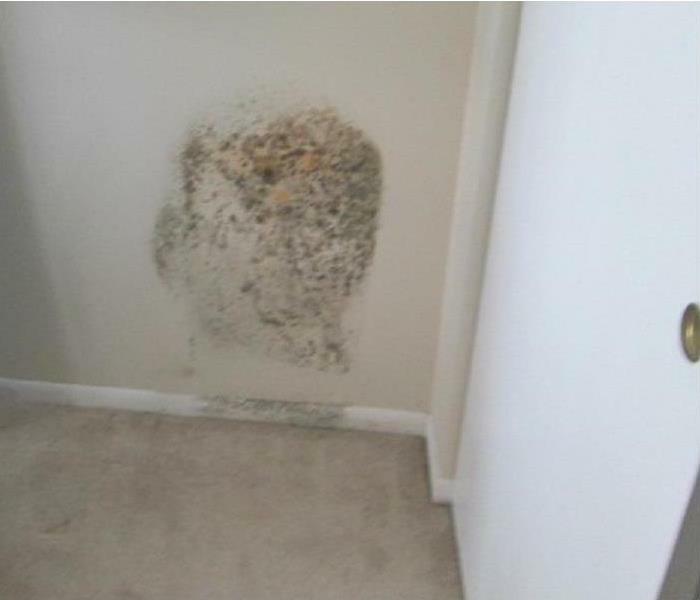 A homeowner in Fort Thomas, Kentucky removed a wallhanging in his home and discovered mold growing on the drywall. Upon inspection, mold was also found in a closet as well as along the baseboards. SERVPRO of Boone County specializes in mold damage restoration and can handle situations like this one. A Florence, Kentucky business called SERVPRO of Boone County for our expert mold remediation services. 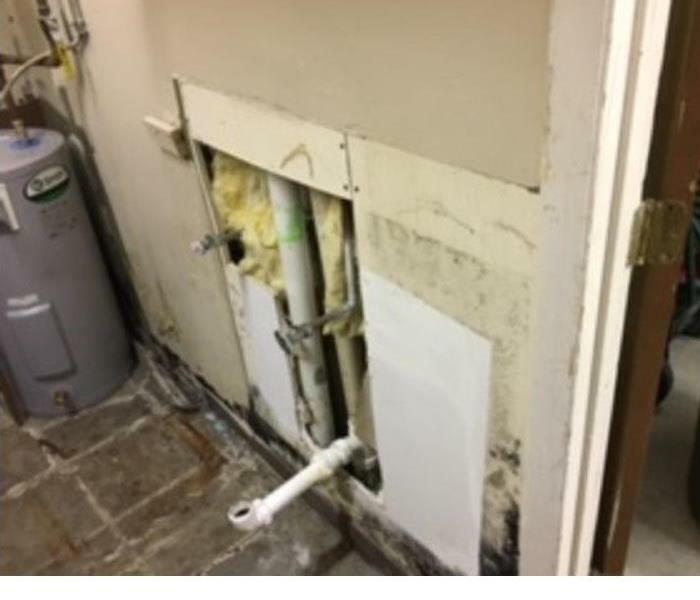 Mold was discovered after the hot water heater malfunctioned and leaked on the drywall and other areas. 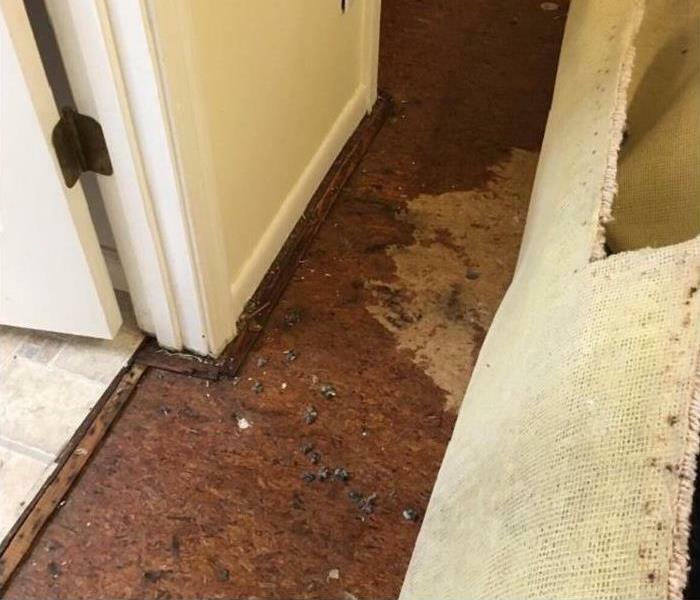 A customer in Florence, Kentucky experienced mold damage to his property. The mold infestation was caused by a leaking hot water heater. There is visible mold on drywall and surrounding areas. Mold remediation services are in progress at this home in Hebron, Kentucky. SERVPRO of Boone County was called to help when a hot water heater malfunction caused water damage in the finished basement. Mold became a problem as a result of the water damage and needed to be managed. 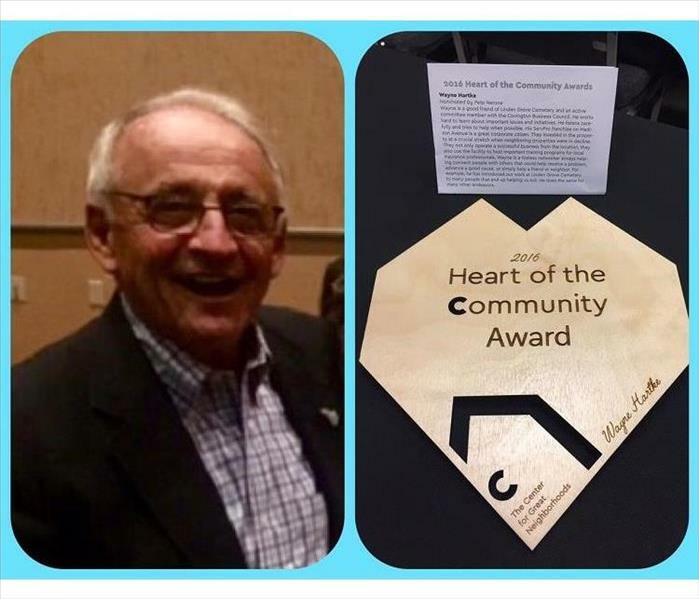 Congratulations go out to Wayne Hartke for receiving the 2016 Heart of the Community Award presented by The Center for Great Neighborhoods of Covington, Kentucky. The award recognizes those that dedicate their time and energy to improve their community. Wayne was nominated for the award by Pete Nerone, Chairman of the Board for Linden Grove Cemetery and Arboretum, who describes Wayne as a "tireless networker always helping connect people with others that could help resolve a problem, advance a good cause, or simply help a friend or neighbor." Great job Wayne!! 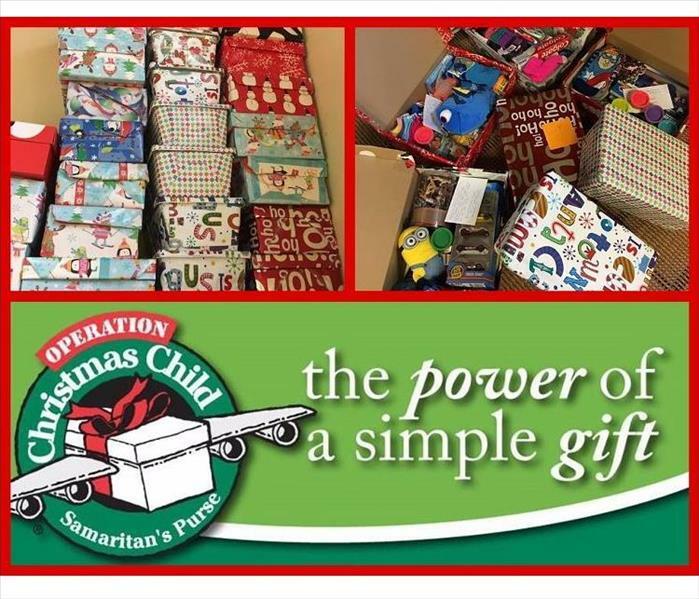 SERVPRO of Boone County enjoyed participating in the Operation Christmas Child Ministry Project. For this project, employees prepared gift-filled shoeboxes to be delivered to children in need around the world. Boxes were filled with toys, clothes, candy, school supplies and much more with the hopes of bringing joy and hope to less fortunate children this holiday season. 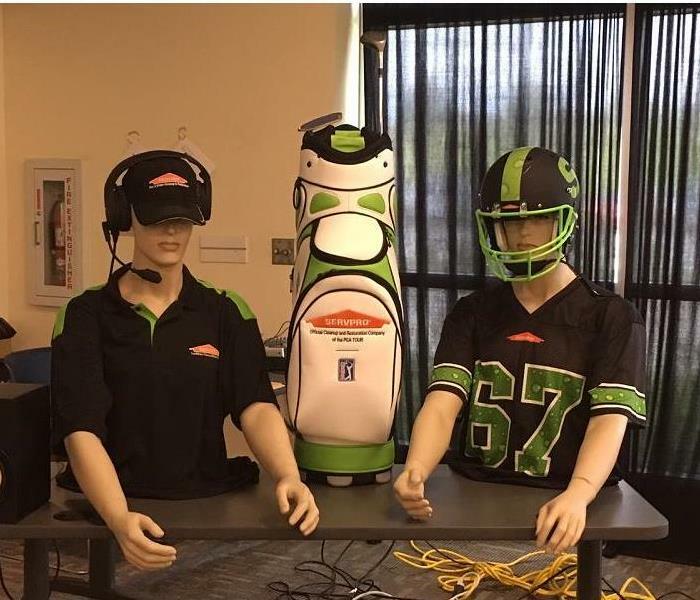 You just might find SERVPRO of Boone County set up on the golf course next time you participate in a golf outing! Be sure to stop by, meet our representatives, pick up some goodies and learn a little about SERVPRO! WE ARE A TOP TEN PERFORMER! 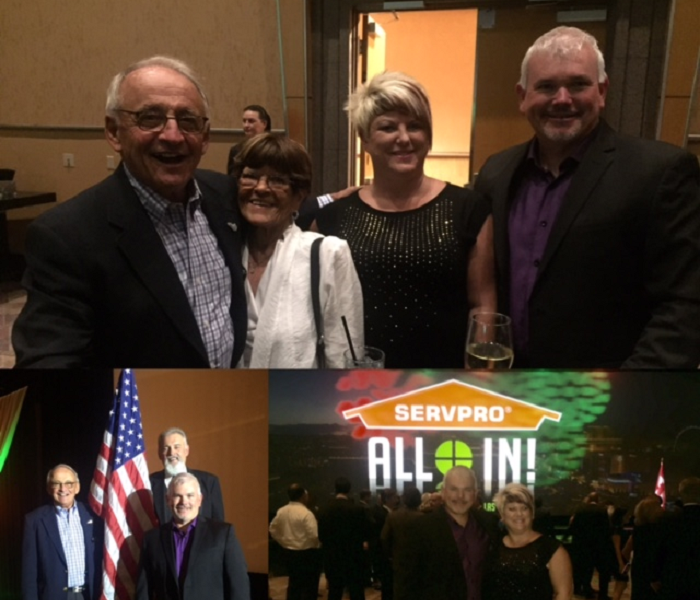 The SERVPRO annual convention was held in Las Vegas, Nevada in June. We are proud and excited to share that SERVPRO of Boone County was recognized as a Top Ten Performer in the SERVPRO System and achieved the Regency Club status. This is the highest level of honor in the SERVPRO system. SERVPRO of Boone County is locally owned and operated serving communities of Boone County, Kentucky. We are happy to be of service to our local communities of Florence, Burlington, Hebron, Covington, Belleview, Erlanger, Union, Walton, Richwood, and Crittenden. 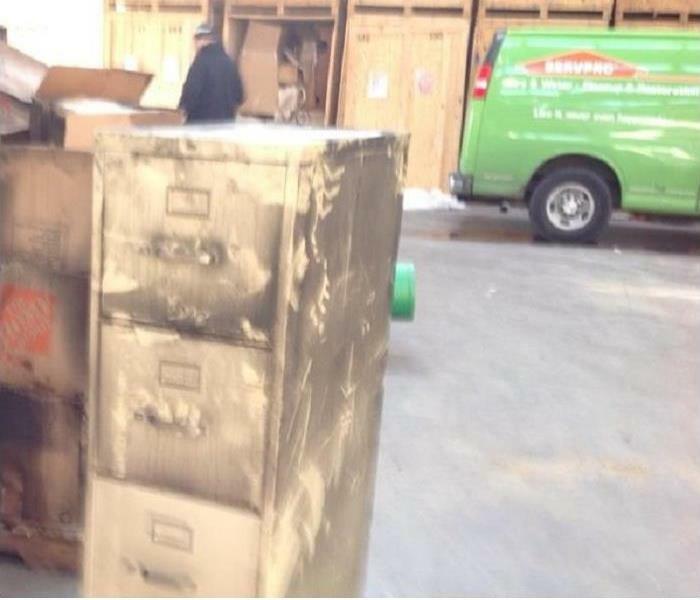 There is never a convenient time for fire or water damage to strike your business! 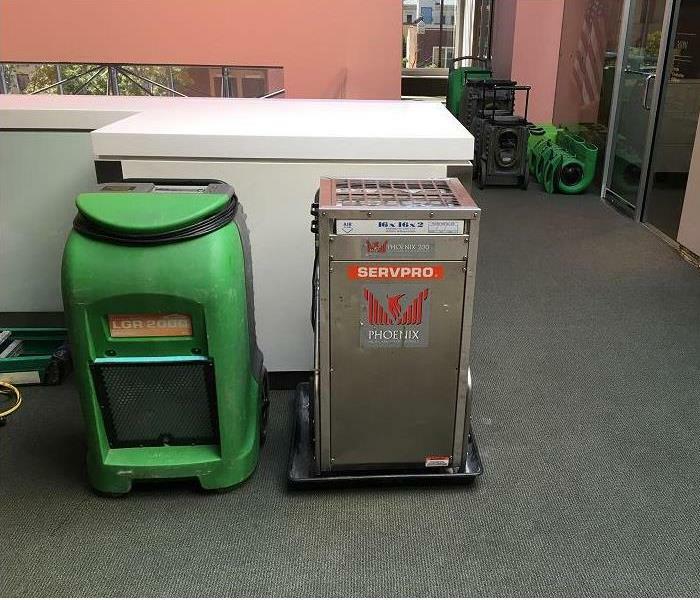 SERVPRO of Boone County has the equipment and expertise to handle commercial losses and get businesses back up and running as quickly as possible. The SERVPRO of Boone County cleaning crews work diligently to clean and restore contents damaged in a home fire. Our crews specialize in restoring contents damaged by water, fire, or mold. Our "restore" versus "replace" mentality helps save money while preserving precious, irreplaceable belongings. SERVPRO of Boone County provides emergency cleaning and restoration services 24 hours a day, 7 days a week, 365 days a year. 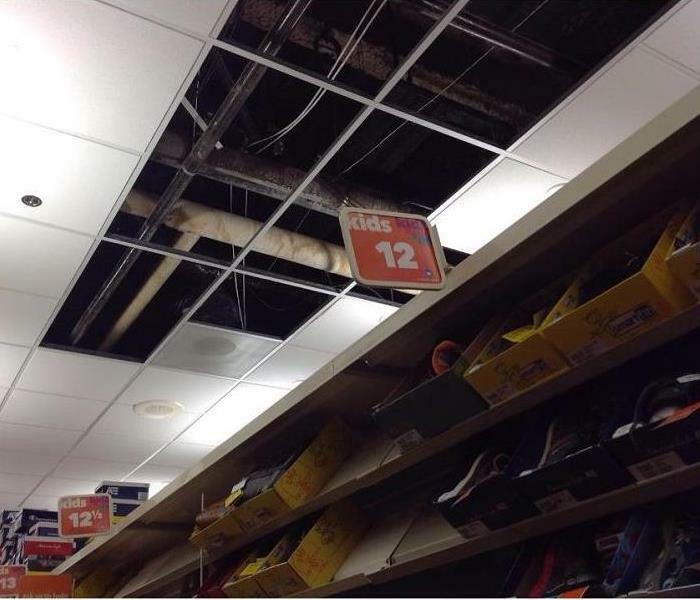 Find you have a water damage at 3AM? Call (859) 746-3400 any time, day or night, and we are there to answer your call. James works tirelessly to clean and restore this area rug affected by water damage. James has many years of experience working with carpet and upholstery and can effectively clean carpets that are moderately to heavily soiled. SERVPRO of Boone County has added an RV to its fleet to be used by the Disaster Recovery Team. The RV acts as a mobilized command center to enable crews to relocate to the disaster site and operate from this mobile office.